Luv-O-Dex Deal Of The Day! Well, I just found out about a really fun project that I can't wait to get my hands on from Glue Art and Paper Studio! So I just had to share! It's called a "LUV-O-DEX"! How cute is that! 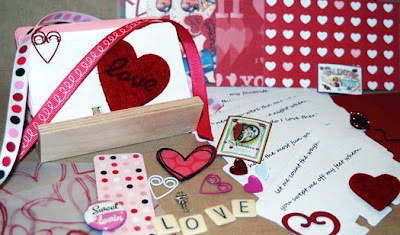 It comes as a kit and it includes: 14 limited edition LUV-O-DEX™ cards, the mini card file, over 100 plain rolodex cards to insert with your own fun ideas, ribbons, and some great embellishments. Here's the even better part--it's only $14.00! I've already ordered mine and will be showing you the finished project really soon. Here's a picture of one already done up--WAY too cute!! Anyway, I think it would make a wonderful and thoughtful Valentine's gift for a spouse, a child or anyone you LUV!! and haooy bday a lil late!! !